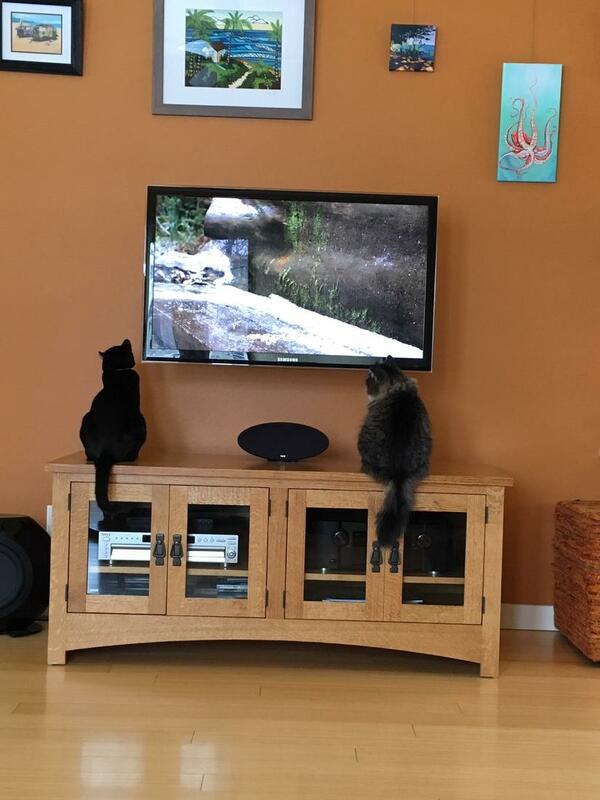 videos for cats are very popular. Thread: videos for cats are very popular. Here's an 8 hour video for cats. Cats like it. At about 45 seconds in, Sula slammed full speed into the TV screen, 4 feet off the ground. Thus ended our experiment with videos for cats. OMG! I can't wait to get home tonight. Thanks for this. ?? This, but we still can't land a man on the moon??? That video is stuffed full of advertisements. Can't teach the cat to skip those. Bloody brilliant! Is it? Sorry about that, but I didn't watch much of it, so I did not know. My cat is interested in those for a few minutes, then, he can't reconcile how the sound isn't coming from the birds, but from speakers off to the side, meows "Fake news!" and wanders off. I sent the link to my wife who is at home waiting for a ride to the airport. Our cats had a similar reaction. Interestingly, the 9-month old on the left is more concerned with the sound issue than the 5-year old on the right. now i just need a claw-proof screen. I have a screen protector on my kindle that should keep it from getting scratched, so I might try that on the floor with a mouse video or game. It has a lot sturdier screen than my laptop or tv. It's thanks to people like you that Microsoft wastes bits making Cortana mention cat videos during Windows 10 OOBE. A very, very, very bad day! Did someone mention cats? Check out these Tanzania cats! Rewarding. Very, very, VERY rewarding.